Alexander’s schedule shows he was away from City Hall 28 days in 25 weeks. Seven days were on official business. Alexander spoke at a conference hosted by Axon, which sells Tasers to the city. He later met with an Axon rep in Rochester. Alexander has several outside business interests, which could conflict with his city job. Alexander appears to do outside work on city time. An ethics investigation is needed to preserve the integrity of city government. Deputy Mayor Cedric Alexander’s official schedule raises serious questions about conflicts of interests and time away from City Hall. Alexander is absent the equivalent of one day a week. The majority of his travel is unrelated to official city business. Alexander assumed the deputy mayor position on April 24, 2017. His salary is $140,000. Rochester for All filed open records requests for Alexander’s schedule and travel. During the 25-week period for which we have full records, Alexander was not at his office for 28 business days. Seven of those days appear to be on official city business, as the city paid expenses. The deputy mayor oversees eight departments, which is an enormous responsibility. It’s hard to see how Alexander is adequately performing his duties. Alexander does not have to disclose all outside income on the financial disclosure form required by the city charter. He also doesn’t have to disclose who paid for his travel. There is some publicly available information about Alexander’s outside activities. Alexander was on the Task Force on 21st Century Policing, created by President Barack Obama. The task force has ended, and the COPS office at Department of Justice is continuing its work on community policing. Meantime, Alexander is among members of the task force cashing in on the “21st Century Policing” brand. Some have ties to International Association of Police Chiefs and the National Organization of Black Law Enforcement Executives. Former task force members created 21st Century Policing, LLC, a law enforcement consulting company. Alexander is listed as one of the LLC’s consultants. Alexander has already violated Rochester’s Code of Ethics. Per the code, Alexander is not allowed to have a business relationship or engage in any professional activity with a company that could impair his judgment or ability to do his job. There are conflicts inherent in Alexander’s outside employment. Alexander’s role makes his relationship with Axon/Taser troubling. Alexander was a featured speaker at the Taser/Axon User conference in June. Rochester purchases equipment from the company. On August 9, Alexander’s calendar shows an hour-and-a-half meeting with Vince Valentine, a National Sales Director for Axon. Since July 2016, the city has spent more than $80,000 on Axon products. Tasers have been the subject of lawsuits nationwide and in the Rochester area. In 2015, a Rochester man died after being tasered. When Alexander was Public Safety Director in Dekalb County, Georgia, a man climbing a wall fell and died after being tasered. Hundreds of deaths have been linked to Tasers. An Associated Press investigation discovered the company has been cultivating financial relationships with police officials, through travel, speaking engagements and consulting contracts. We must have public officials who can be trusted to independently assess the purchase and deployment of Tasers, as well as other equipment sold by Axon. Alexander may be doing some of his outside work related to law enforcement on city time. His schedule had five conference calls coded “COPS A21CP Initiative: Site Team Update calls ( COPS, SSCs, OAs, CNA, IACP).” These calls occurred in the run-up to a trip to South Africa where social media posts indicate he spoke on “Policing in the 21st Century.” On social media and in an interview, Alexander said he was in South Africa to train police chiefs. Alexander should disclose the financial arrangements for this trip. Alexander’s August trip to Atlanta and Washington, D.C. is concerning. Alexander previously announced the purpose of the trip was to learn how to improve security at public events. Alexander’s schedule for the Atlanta trip, taken from a Friday to a Tuesday, showed he attended the National Organization of Black Law Enforcement Conference. There are no meetings with Atlanta police officials on the calendar, though it’s possible they occurred. From Atlanta, Alexander flew to Washington for the American Psychological Association conference. Did Alexander use event security as a pretense for getting the city to pay for a trip that otherwise had dubious public benefit? In addition to the National Organization of Black Law Enforcement Executives conference, the city paid for Alexander to attend the International Association of Police Chiefs conference in Philadelphia in late October. Alexander has business relationships with members of these groups. What is the real purpose of these trips? Alexander’s relationship with URMC is also an ethical issue. The city has numerous financial ties to the institution. 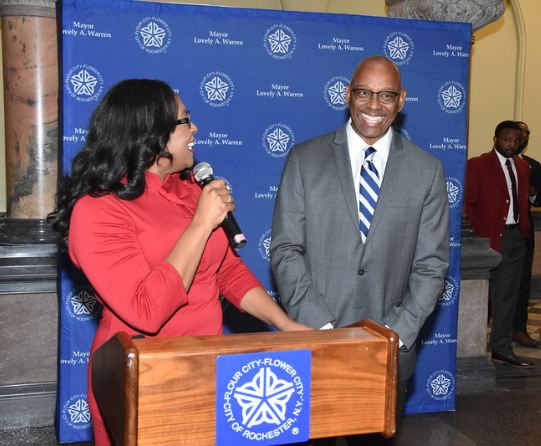 For example, the city has partnered with the University of Rochester on several projects, including giving a $20 million loan to College Town’s developers and providing millions of dollars for infrastructure for the project. Alexander had separate meetings with U of R President Joel Seligman and Vice-President Peter Robinson. He attended a garden party hosted by Seligman, and gave a speech at URMC. What hat is Alexander wearing during these discussions? Alexander’s ties to the U of R mean ethical conflicts are inescapable. It appears Alexander is doing URMC work on city time, as he had four separate meetings with doctors in the psychiatry department. It’s unclear why the city funded his trip to the American Psychological Association conference, as this expenditure seems to benefit Alexander and URMC far more than city taxpayers. Alexander’s paid speaking engagements came under scrutiny at his last job. The Dekalb County Board of Ethics ruled Alexander could not discuss his current position and appear before contractors and any group getting a benefit from the county. The Rochester City Charter required Alexander to disclose these arrangements to his immediate supervisor – Mayor Lovely Warren. If Warren believed there was a reasonable question of conflict of interest, she was obligated to seek an opinion from the Board the Ethics. The agendas and minutes show no request was made. Rochester for All is filing a complaint with the Board of Ethics regarding Alexander’s activities. The board should issue an advisory opinion on Alexander’s outside employment. Citizens don’t have standing to bring complaints to the board, but there’s nothing stopping the board from taking up this important matter. Alexander should also immediately and publicly disclose all income. Rochester for All also has a pending ethics complaint regarding the city’s purchase of 100 copies of Alexander’s book. Rochester for All has raised questions based on publicly available information and open records requests. It’s possible there are legitimate and reasonable explanations for some of our questions. But it’s likely there are major ethical problems regarding Alexander’s employment. That’s why we need a robust investigation and substantial policies guiding such situations in the future. While Alexander has much to contribute to Rochester, city residents deserve a deputy mayor who is 100 percent dedicated to their interests. We deserve a deputy mayor who is engaged and present. We deserve a deputy mayor who is transparent about his outside income and has no conflicts. At this time, Cedric Alexander does not appear to be that deputy mayor. This is outstanding reporting. Thank you for bringing this to the community’s attention. A similar in report needs to be done on Bill Reilich in the Town of Greece. Great reporting, Rachel. Monroe County is a hotbed for corruption, no surprise the City has its bad players. Unfortunately, the hatred between races and economic groups blinds the “watchdogs” on both sides. This includes the City of Rochester, “apolitical” organizations such as the Genesee Transportation Council and RGRTA, and the mother ship, Monroe County. I am glad to be from that place. Good luck in your battles! See facebook page California Rollin Ect, for economical development corruption by the county, City, and the judicial system of Monroe County.